Colin McEnroe's piece in the Hartford Courant is a frightening tale about the indifference of the police to crime when it becomes so commonplace. A two hour wait for a call about a burglary. "I live in Gotham City, but there's no Batman." In Boston, 65 parishes have been shuttered since 2004 and 30 have been sold - some to developers. And now, these former neighborhood institutions are becoming something truly unholy - high-priced condominiums. This article in the Boston Globe chronicles the trend. But hey, at least the priests are offering their blessings to these buildings' new uses at the developer's behest. The American Wind Energy Association just announced that the US has overtaken Germany as the worlds top wind power generator, you're certainly familiar with T. Boone Pickens's wind obsession, and DOE is claiming we could be generating 20% of our power with wind by 2030. Check out DOE's wind energy potential maps and AWEA's run down of installed and pending wind power projects in the U.S. The question is can the country's transmission infrastructure withstand a redistribution of power generation? Who will build the needed infrastructure? In my home state of North Dakota, often called the "Saudi Arabia of Wind," the transmission capacity problem was cited so frequently for slow wind build out that the state government has gotten involved. The Information sector of the economy is has followed an interesting trajectory over the past 15 years. 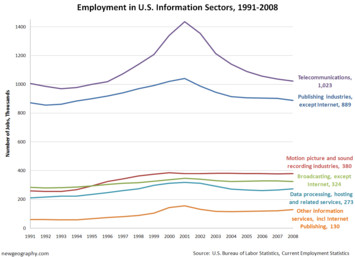 The info sector built up to a huge peak in the early part of this decade, and has seen general decline since that time. The big boom and bust was caused by employment inflation of the telecommunications sector. Publishing followed a similar, but less extreme path. Both industries have reverted to employment levels in the early 1990s. Motion picture and recording, data processing, broadcasting, and Internet publishing have all seen modest gains since the early 1990s. 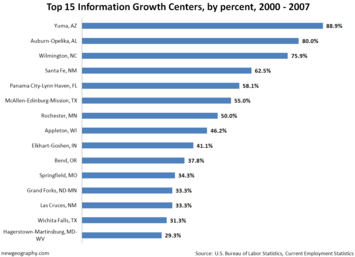 Here's the fastest growing metro areas in the information sector through the recent period of decline. 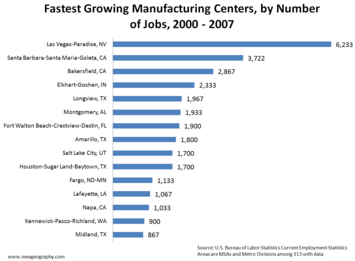 We're seeing a decentralization effect here: smaller metros with historically manufacturing-centric otherwise specialized economies are building information industries. 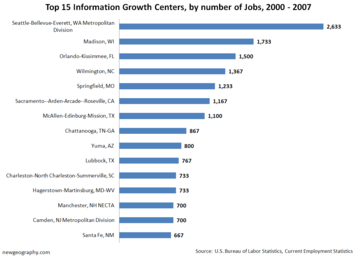 Seattle is leading the charge and Madison is rapidly becoming and information center in the central states. I wouldn't have guessed Springfield, MO or Orlando would show up here. You may have read our recent commuting case study of the Los Angeles region written by Ali Modarres. Ali put together some detailed commuting pattern maps of the area. Here's another similar commuting map of the Chicago area. It's interesting to note the major difference in commute times of neighborhoods often in close proximity. Obviously, distance to jobs matters, but so does the occupational make-up of the neighborhood. 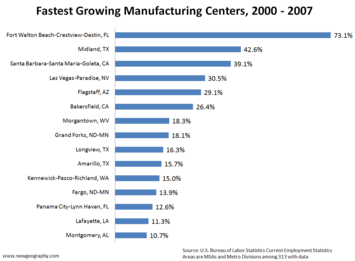 Read more manufacturing analysis in as part of our Best Cities Rankings: Is Manufacturing Weighing Down the U.S. Economy? Milwaukee is having to put quite a spin on the latest census figures. A recent Journal-Sentinel article trumpets the the city’s decade-long population plateauing as a sign of “steadiness.” Cities losing the most population in Wisconsin included Whitefish Bay, Wauwatosa, West Allis and Brown Deer. Guess what they are — Milwaukee suburbs. With the city losing people at the edges, the newspaper was lucky enough to find someone who had actually moved from Whitefish Bay to Milwaukee to help take the sting out. Here's a rundown of the recent population trends in the State of Wisconsin. US Census released the latest population data on cities this week. Looking at the top 15 largest US cities, only Sunbelt cities of Phoenix, San Antonio, Houston, and Jacksonville are ahead of the national rate since 2000. Interestingly, the cities of San Francisco and San Jose are making a recent comeback after losses early this decade, although San Francisco is still trailing its year 2000 mark. Tory Gattis explains the situation in Houston, where the population of the city has exploded since 2005. The fastest growing larger city overall since 2000 is Raleigh, followed by a pile of places in warm climates, two in the Denver metro, along with plains cities of Omaha and Oklahoma City. Many California cities fill out the smaller cities list, along with two from the Chicago metro and Olathe and Sioux Falls on the plains.